Well, the rain has set in today, and the great weather we had yesterday is no more. At least I got my PBRF draft portfolio ready for review by Massey. I guess it means that today, we have to dig into the archive for a seascape picture. This is a view of Auckland from Stanley Bay. It has this year, turned out to be my most popular seascape photo. It was taken on of those heavy rain and winds evening. Fortunately things cleared a little before I gave up hope. The picture required the use of 2 ND grads. One was to hold back the bright light on the Auckland skyline. The other was to even the exposure between the dark foreground and lighter mid-region. I was positioned on the edge of the rocks, tripod legs off in weird angles to find support. 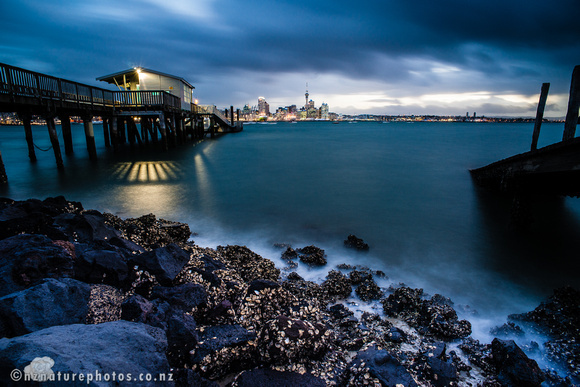 I had lined up the skytower with the wharf, so that an arc would be described around the rocks towards the city skyline. Halfway through the shooting, the lights came on and completed the scene. That is a great photo, the foreground of rocks and oyster shells, looks fantastic with the water on exposure ! !